Can Colbert's Audience please STFU? It has to be prompted. The unceasing, delirious vocal adulation he receives every show. 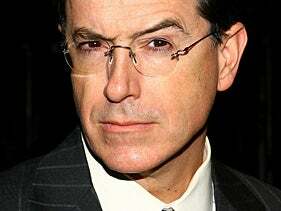 If there isn't a warm up comedian urging the people on, Colbert has the most rabid fans since the teenage girls showed up to the Ed Sullivan theatre the night this new British band was playing. They would die for him if he asked them to. That's unhealthy—no one should be that loved—but its ancillary to the imposition they put on the show and my viewing experience. Lots of mindless cheering I don't want to get in the way of a joke, or just when he's talking. Watching last night's episode, the crowd went more nuts, if you can believe it. Jane Goodall, appositely, was on. Who else to tame a bunch of wild chimps. Stop it. We all love him. Settle down. And I always play " Is the audience conservative?" when a particular piece of satire gets applause. They surely know he's not, right? Or is that years ago university study that told us Republicans think he's one of them still the case? In any respect, shut the hell up, Colbert Audience.